10 Reasons Why I Dread Halloween in Australia! 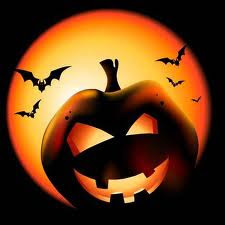 So it's 5.30pm in Australia on 31 October, and fast is approaching what is an American celebration, now creeping into Australian homes, Halloween. So, why am I dreading this evening. 1. Our Australian sun sets at 7.23pm, which coincides with my 3 and 5 year olds bedtimes, AND when all the ghouls and ghosts and witches come knocking. 2. Scarily dressed children will ring our bell and bang on our door for who knows how long, keeping my kids awake, and scaring the pants off them. 3. I am forced to buy and give away yummy lollies and chocolate. For those of you with a sweet tooth you know how faux par this is. Its bad enough I have to share with my kids, but others' as well! 4. I berate myself for being so worried about the judgements of both the children and their parents for not having goodies to give them. Hence, I have a large stash waiting by the door. 5. It is super hot here and I have felt the necessity to dust and vacuum meticulously all areas of the house visible when you open the front door so I won't be judged by strangers. On the up side, I love a super clean house. 6. On a serious note, as a parent, it worries me to see young children knocking on strangers doors, especially when unaccompanied by an adult. There are many not so nice people who could be saying, doing or giving their kids anything. Unfortunately that is just the world we live in. Our kids are too precious. 7. I have "Halloween Decoration Envy" with our neighbours across the street. They went all out this year. As if I'm not already dreading being overshadowed by their amazing Christmas light display this year. Love you guys, but grrr..
8. I can't relax in my pyjamas until ...., well, until an indeterminate time. 9. My inner self is tempted to go up the shops and buy the now half price Halloween decorations and pretend we are part of it all. Oh dear. Hey my little American friends, does everyone love Halloween there, or is it not for everyone? I'd really be interested to know.